Your private sewage system is an important part of your everyday life. It is important that these systems are installed and maintained properly to prevent minor or major nuisances. An improperly operating private sewage system can be a nuisance to a homeowner and/or neighbors due to bad odors being released, improperly treated sewage being discharged, or even the sewage backing up into your home. The Environmental Health staff review and approve plans for private sewage disposal systems BEFORE they are constructed. Improperly constructed and maintained private sewage disposal systems can pose health risks, therefore the Environmental Health staff review plans and inspect the installation of systems to ensure that these systems are installed properly. Such systems include but are not limited to aeration systems, septic tanks with subsurface seepage fields or buried sand filters, or holding tanks. All systems have their advantages and disadvantages. It is up to your private sewage contractor to design a system that is best for your residence and property and that will conform to the Illinois Private Sewage Disposal Code. As of January 1, 2014, numerous updates have been implemented to the IL Private Sewage Disposal Code. 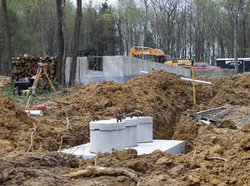 Before the installation of a private sewage system on your property, please contact the Environmental Health office or have your private sewage installation contractor contact the Environmental Health office to get an application for the construction/installation of a private sewage system. The Private Sewage Application is also linked on the side bar. Only Illinois licensed private sewage installation contractors or the homeowner are allowed to install private sewage systems in Illinois. 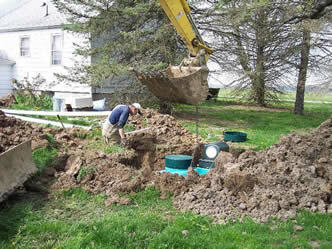 A soil analysis by a certified soil scientist may be needed before approval of your system can be given. A $100.00 Permit Application fee payable to the Crawford County Health Department is also required. If an aeration system is installed, the system's dealer (who is not always the installation contractor) is required to furnish an initial 2-year service policy to the homeowner. It is recommended that this service agreement be renewed once it expires to ensure that your system is inspected and maintained on a routine basis for proper operation. An improperly operating system could create nuisance conditions on your property or even your neighbor's property depending on the location of the system. In most of Crawford County, the majority of systems installed are those which have an approved surface discharge such as aeration systems or sand filters. Soil conditions prevent systems with subsurface seepage systems from being installed in most areas. Effective February 10, 2014, any new or renovated surface discharging private sewage disposal system that discharges effluent to a water of the United States, must be covered by an Environmental Protection Agency National Pollution Discharge Elimination System (NPDES) General Permit prior to system operation. NPDES General Permit Notice of Intent applications may be obtained at the the Department or by following the link above. The EPA NPDES Permit process is separate from the CCHD Private Sewage Application process. The CCHD is not responsible for EPA NPDES General Permit application, approval, issuance, or compliance as responsibility falls on owner/operator of the private sewage disposal system.